The amount former federal politician Craig Thomson stole from the Health Services Union is becoming less and less as the smoke and mirrors of the ALP propaganda and corruption machine continue to work. Exactly how much Craig Thomson stole will never be known but my estimate is that it could exceed $1,500,000. Craig Thomson’s fraud and theft from the Health Services Union (HSU) is worth looking at again as Mr Thomson is due in court soon for his criminal appeal for stealing $28,000 and he will also be back in the Federal Court next March for stealing $243,000. It was estimated by FWA that Thomson spent a total of $270,000 of HSU funds for his 2007 Election. At this point it would have to be close to $500,000 that Craig Thomson was directly accused of stealing. But yes there’s more! During his time as National Secretary of the HSU Craig Thomson was also given an American Express credit card from a printing supplier who colluded with Mr Thomson and Michael Williamson to rip off the HSU $millions. 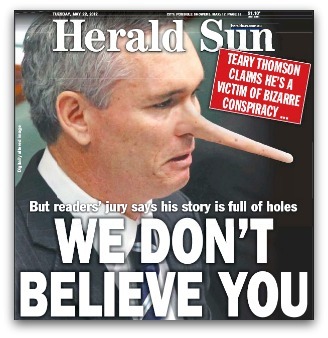 I would be very surprised if Craig Thomson didn’t get his fair share of the stolen money from the printing scam. If he did get his fair share then we are talking over a million dollars just on the American Express card. Add $1 million to the already estimated $500,000 that he stole then we have a total of $1.5 Million possibly stolen by Craig Thomson during his time at the HSU. What is very strange is that no one seems to want to recover any of the stolen funds from the printing scam. To my knowledge the NSW Police, the HSU and the Fair Work Commission have all failed to take any recovery action for the scam from Michael Williamson, Craig Thomson or John and Carron Gilleland who owned the printing business Communigraphix. How much does Thomson owe now? At some stage there should be a full audit of how much Craig Thomson was alleged to have stolen and how much he was charged with stealing and/or had to pay back. The reason the FWC dropped the $120,000 is because ex union official and current FWC General Manger Bernadette O’Neill decided it was not in the public interest. Ms O’Neill should have been sacked long ago. The NSW Police appear to be sitting on fraud charges that they could lay against Craig Thomson as well but have not taken any action. One example of course is the American Express card. Michael Williamson was general secretary of HSU NSW branch from 1997 to 2012 which is 15 years to 16 years. So times the “more than $5 million” by 3 estimated for the 5 years from 2006 to 2011 and that is almost $18,000,000 which is near enough to the estimated $20,000,000. To this day Craig Thomson has said nothing about what he knows of Williamson’s fraud. Thomson should get 10 years jail just for helping Williamson and saying nothing. There are a lot more Labor Party skeletons in the closet that Craig Thomson keeps his mouth shut about and Labor owe him for it. Thomson also stayed loyal to the Labor Party right to the end of his term in federal parliament in 2013 even though he resigned from the Party. So the Labor Party do their bit when they can and help Craig out from time to time such as FWC General Manger Bernadette O’Neill dropping a lazy $120,000 from the lawsuit against Thomson. And it goes on and on and on – how corrupt are these union thugs and the labor party? Will us, the general public ever know? Will we have an honest Commission to find these alleged stolen funds? If so, who will pay those funds back to the Union Members? These people rorting seem to think they above the law. I do believe every word you have written here, and I find it unbelievable, that this piece of scum is still walking around free. The RC better come good, it is the only hope we have. Clive Palmer et al is the only hope in this corrupt mess. Have you considered Mr roger m just what will happen when, not if, Mr Palmer is convicted of fraud?